I was pleased with the lightness of the crumb, which was more open than I expected for a rye bread. That was from the high proportion of white flour in the formula (85%). I made a silly mistake in shaping the bread: I forgot to flour the countertop. Yes, it’s hard to believe I was so absent-minded, but… it happens. To shorten a long story, I had to re-shape it, and the extra handling resulted in a bread that was a little too long and a little too flat. Still, it didn’t compromise the internal structure or the taste, and a recipe that withstands my boo-boos is a recipe worth keeping! Similarly to what happened in the Bread Baker’s Apprentice Challenge, we will not post the recipes for this group project. The Light Rye Bread can be found on page 197 of Hamelman’s BREAD. It is also available online. « COME MELLOW WITH US! I can’t believe your crumb. I have ordered flour for the rye and the bagels. I made the wrong bread for the rustic bread, a bit like forgetting to flour the counter. Except I forgot how to read. I am amazed at how beautiful your rye looks. Looks awesome, Sally! 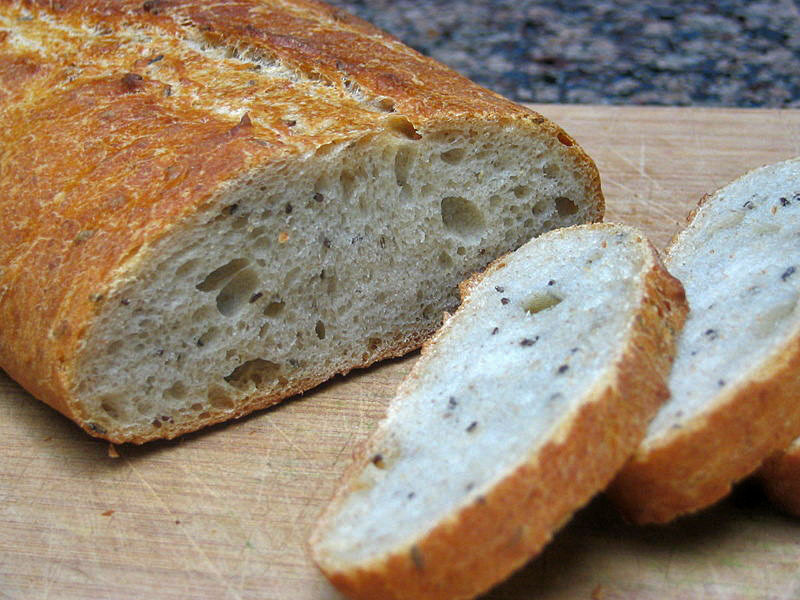 I’ve debated skipping this one, but yours and Andrea’s look so good . . . .
@ap260: the dark spots are caraway seeds indeed. You can definitely skip them, lots of people object to their flavor, I guess. I love them, but my husband would certainly prefer the bread with fewer caraway seeds, or without them altogether. He finds them a little overwhelming. Your loaves look great! I’m looking forward to baking this one. Looks good! I’m going to attack the bagels first and then make the others. Do you think I need a blog to do this? Is there a lot of work involved in keeping one going? I think keeping a blog involves some work, but I am pretty upset that I did not start mine earlier. I love it! I had a hard time in the beginning because I knew zero about blogging – had to learn how to do everything, but WordPress in particular has a great support forum, available pretty much 24hs/day. I can only emphasize what Sally said. I also have a WordPress blog and think it’s not that complicated. If you need help just post in the Mellow Bakers’ forum or on my website, and I’ll try my best to help you. How kind of you both! 🙂 I have just posted my bagel results on MB forum and that took me forever to sort out photos and upload to photobucket etc etc. Where do you start to make a blog, go to WordPress and look for guidance? You want wordpress.com – the other one you need to self-host and it’s not the way to go as a first step. Once you go to the wordpress.com website, you can register a blog and start from there. Make sure to visit the support forum and spend some time reading the questions and answers, I learned a lot that way, even before I launched the blog. GOOD LUCK! I am so excited for you! Great to know that a white starter can be converted to a rye starter! I always thought I’d have to start over to make a rye one. I like the idea of a mellow rye bread too! Yes, Lisa, you can go in both directions, converting white into rye and vice-versa. Actually, to start the starter (sounds funny, doesn’t it? 🙂 rye is often the flour of choice, because it is easier to ferment than wheat. Once it gets going, it is converted into a “regular” white starter.